Jungle Jim #3 by Paul Tobin and Sandy Jarrell continues to be one of Dynamite's best titles and one of the most entertaining comics period. Our funny and acerbic hero can summon deadly spiders to attack the enemy while finishing a fifth of whiskey. He can transform into a giant gorilla when needed and console a worried friend all in the same afternoon. Ming might rule the galaxy, but Jim is the king of the jungle on Arboria. Jim, Lille, and the rest continue to make Ming's minions' lives on Arboria hell. They keep attacking their camps and releasing the natives being held as slaves. The coordinated attacks are all in the name of Daris Devrille, Lille's imprisoned brother on Ming's planet, who they hope will be brought to Arboria for execution so they can rescue him. It all sounds very serious and it is, but Tobin balances the action with humor and even makes time for a poignant moment as well. 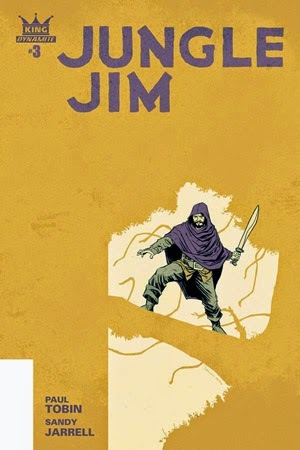 Jim is the attraction here as the titular character whose uninhibited bravado and charm carries the series, but Tobin smartly developed the supporting characters in the first issue. Jim's big personality can be overwhelming at times, but it's contrasted well with the determined Lille who will risk everything to save her brother. Jarrell's action choreography is brisk with big panels and great pastels by Luigi Anderson. Layouts are varied and perspectives evoke a sense of energy and tension. The penultimate issue leads us into the inevitable showdown between Ming and Jim's rebels. It will all end too soon though as Jungle Jim is worthy of an on-going series but this miniseries ends with number four. Let's hope Dynamite takes this funny adventure series and gives it a permanent roster spot.